There is a template wiki available to start with your own family "genealogy" ! A "Clone" button on the start screen lets you built a "clean and pure" genealogy-wiki for your own usage with your own data - private or public - with only 2 persons prebuild: unknown father & mother. 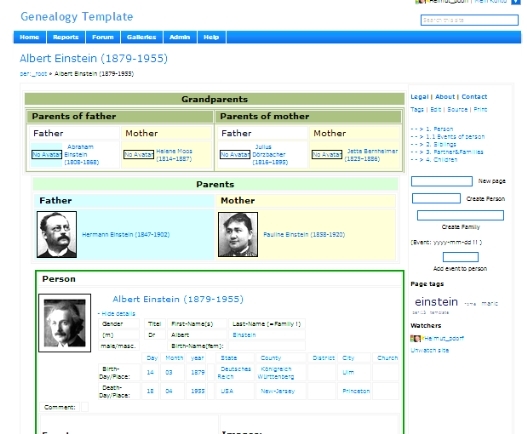 On this example template the data over "Albert Einstein" and his family is stored to have a look and browse how it works. Built with lots of live _template pages for "person" and "family", and perpage dataform fields for many fields to select. I think "Clone" button on the start screen lets you built a "clean and pure" genealogy-wiki. Good!